RED is the color of our Life Blood. 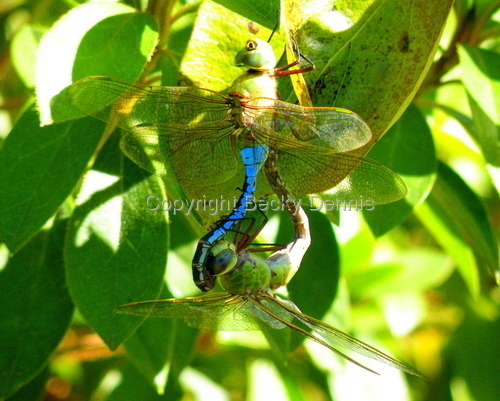 As I was strolling through our Garden with the Camera around my neck, I was almost hit in the head by a pair of Colourful Dragonflies procreating in a mid air dance. Suddenly, they must have decided to rest and they flew into a small persimmon Tree to rest. I was so excited to be able to capture this Image! It shows right frontal brain humour at it's best! 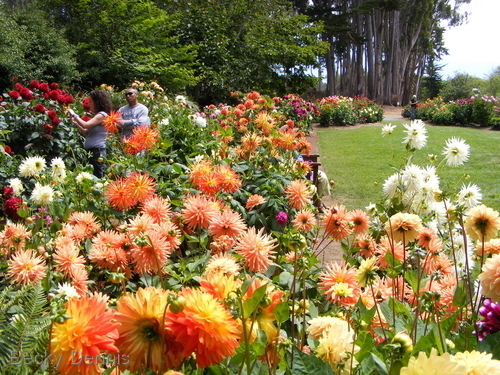 My Passion for Flowers is well known by those that are closest to me. IRIS Flowers are actually a flower of HOPE and they have a sweet scent. In my Life, I am always pushing mySelf further with my clay art. 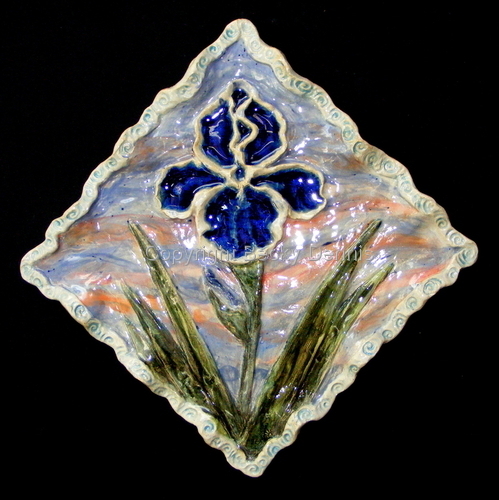 This Piece was actually an experiment with stained glass and glazes that fortunately turned out. Traded to my VET for $175 worth of beloved CAT care. This lovely Lily grows in our garden and shares Her beauty generously with all who pass by. We must also share out Gifts with the World. Reduced price. Iris is a flower that symbolizes great Hope and beauty to me. We first encountered mass numbers of them on a Honeymoon visit to OREGON. 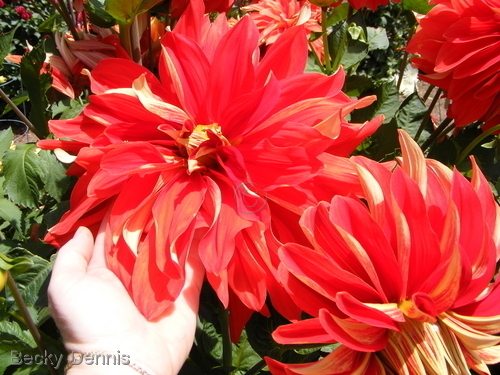 There were so many colors and varieties. It intrigued me to discover that they have a sweet and unique fragrance. I can grow almost anything, except Iris! We are simply too hot and humid in south Mississippi. We do have a native variety that is lovely. 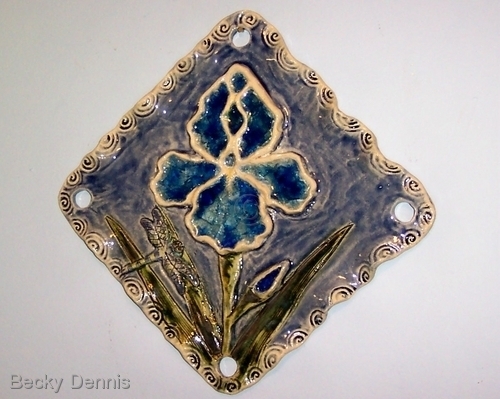 These Pieces have melted stained glass in the Flower that is melted on the second firing. Dancing Dragonflies abound in south Mississippi in the summer. As I swim at the local pool, I watch their happy antics. 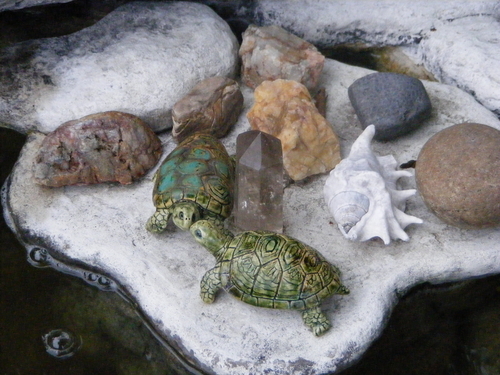 In the garden, they happily fly freely.These clay Sculpted Pieces were attached to a lovely Piece of Driftwood with a Heart area in the center of it. SOLD, but more are being created. 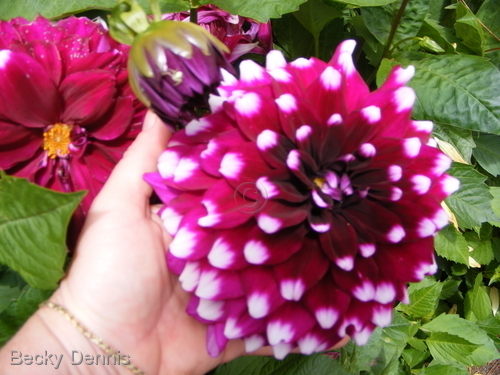 Most of my Friends know that Gardening is one of my Passions and recently, I was given a new Flower. When I sat and really Looked at the Plant/Flower, there appeared to be EYES looking back at me. Who says that Flower don't have Feelings? This is NOT photoshopped. It amazed me that I was able to capture this image. 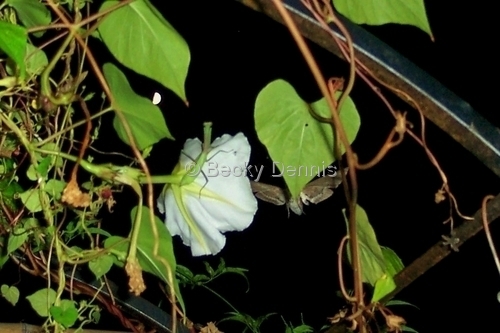 When I came home that night, I discovered the mantis on the moonflower with the moon in the background. I told Chris the only thing that would make the picture "perfect" was IF a moth flew by when I captured that moment. Honestly, then a moth appeared and I happen to take the picture at exactly the best moment. 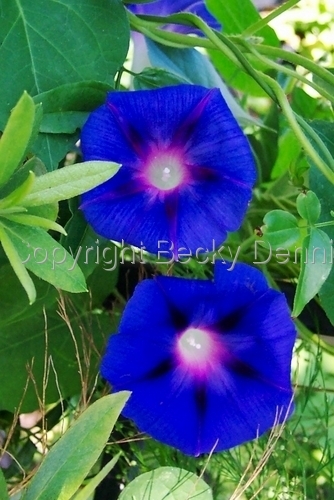 Morning Glories sing of radiant Blue beauty. This patch of morning glories grow near the entrance to our Home during cool spring days. Sometimes I plant them in the fall and they bloom all day long! Chamomile flowers sing of Calm. 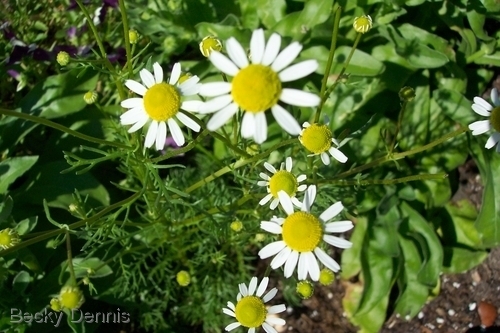 Since I discovered how calming chamomile flowers are when made into fresh herbal Tea and tinctures, I have been growing them in our garden. My absolute Love of gardening, photography, and writing is merged in this Presentation of a Morning Glory that kissed me with it's beauty. 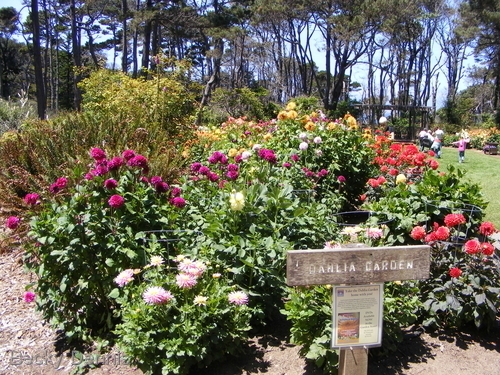 View of the botanical gardens near Mendocino,CA. 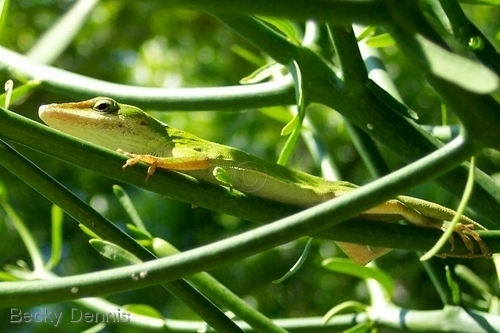 The lizards in our yard live up high in the trees and plants since the cats can find them when they are within reach. 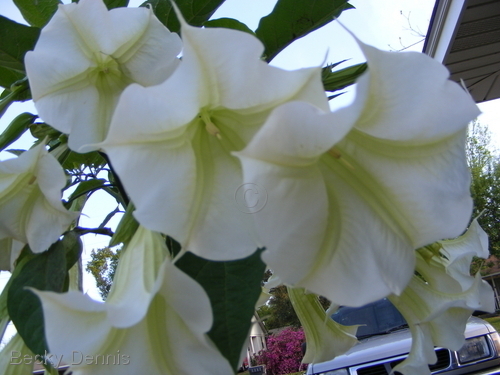 This image was captured one day as I was looking up at a multitude of fragrant Angel Trumpet flowers that nearly knocked me over with their heavenly fragrance. It is available to purchase in many sizes including greeting cards. This pair of Mississippi gulf coast Box Turtles simply showed up in our yard around my birthday and have had their share of babies. They are NOT captured and are perfectly free to roam. Post Katrina, we noticed that many have moved to a local park where there is a pond. We see them sunning themselves on the bank. This pair of Mississippi gulf coast Box Turtles simply showed up in our yard around my birthday and have had their share of babies. They were having a private party the day I took this image. They are NOT captured and are perfectly free to roam. 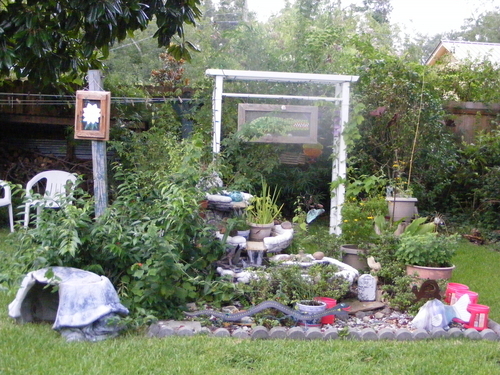 Post Katrina, we noticed that many have moved to a local park where there is a pond. We see them sunning themselves on the bank. 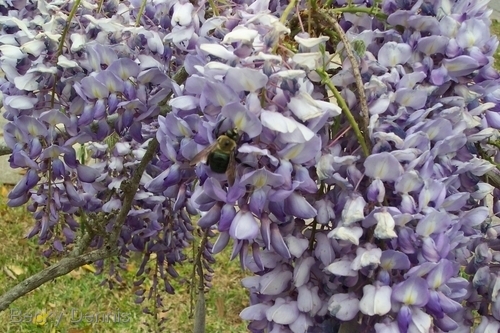 During the warm spring days the wysteria begin to climb and climb and climb invasively, but their fragrance is uniquely beautiful. 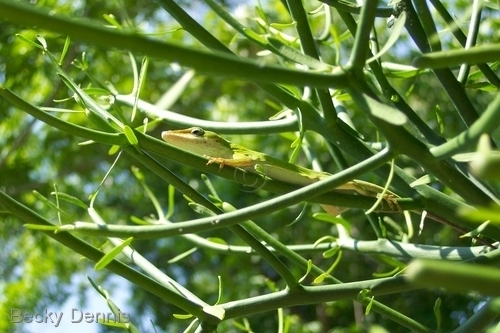 During the warm spring days the lizards begin to appear. Since we have so many "cats" that love to catch them, they have learned to climb UP high where they are a bit safer. 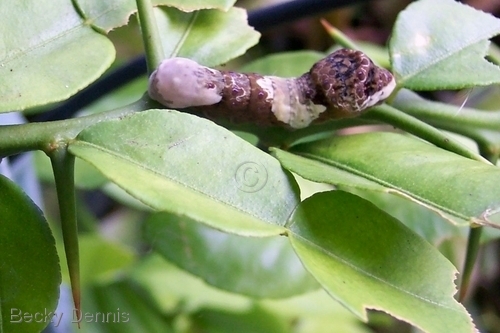 The first time that I spotted this odd, grey and white caterpillar, I was shocked when I gently touched it and it seemed to stick out its tongue. Actually it emits a sour smell when it does this as a defense to communicate it is unpleasant to eat. 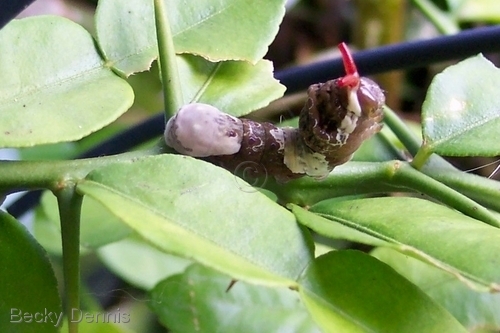 Although it devours my citrus trees leaves, I feel there is more than enough and I let it live. It makes such a beautiful butterly eventually! 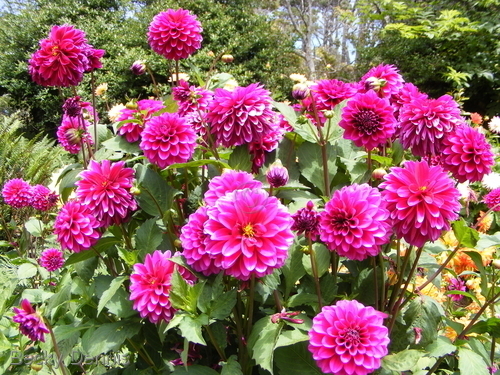 This image was captured in the garden one day in May. 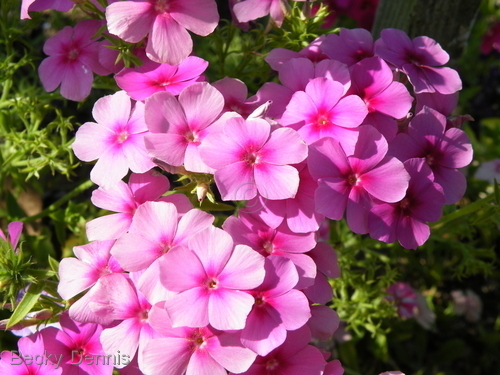 Years earlier I had dreamed that I was suppose to plant "Phlox" flowers. I had never seen them, but the following day found a seed packet at the store. They come up every year in rainbow colors that make my heart sing. 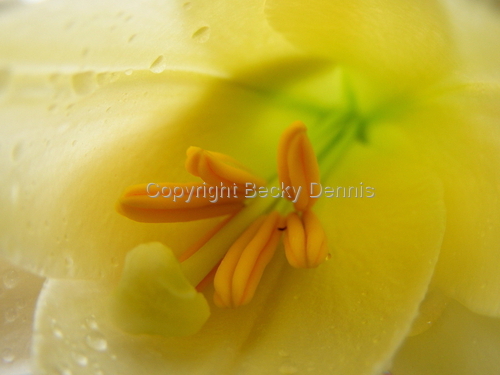 It is available to purchase in many sizes including greeting cards. This image seems to Radiate and Glow with Life Energy. 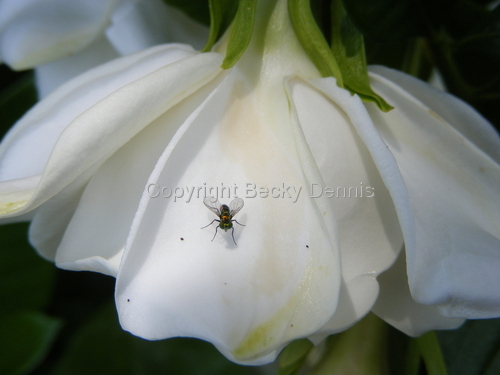 All photos are available to purchase, including in greeting card size. 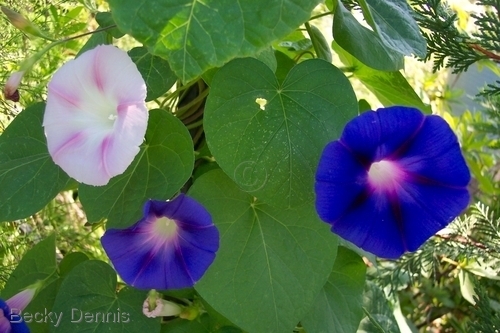 This light pinkish morning Glory stands out as different amidst the striking blue ones. 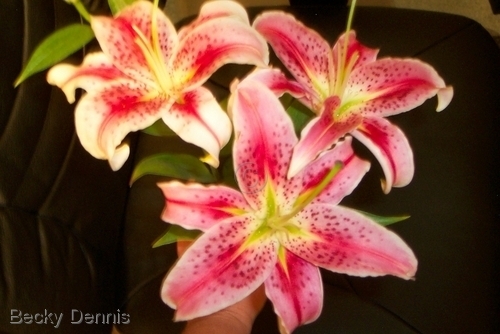 En-Lighten Up with stargazer lilies. 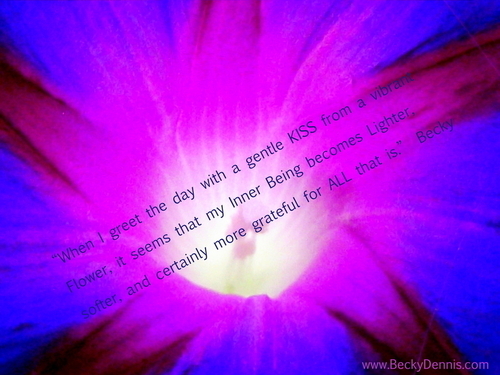 This is the amazingly fragrant flower that I talk about in my story entitled "Keeping my heart Light as a Feather." It can be found under the storyteller shares section. 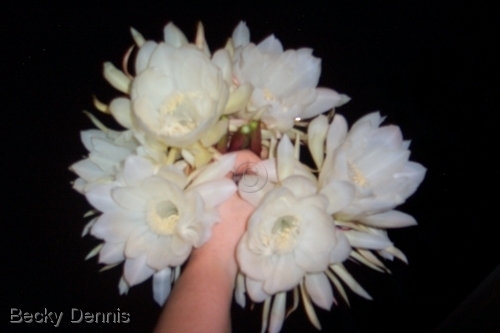 A bouquet of Night blooming cactus flowers. 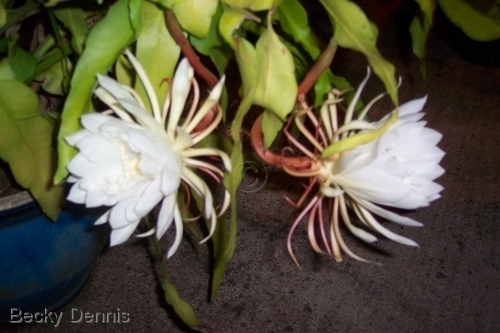 This is another amazingly fragrant night blooming cactus that my friend Julia (Jewels to me cause her friendship enriches us!) initially gave me over 20 years ago. 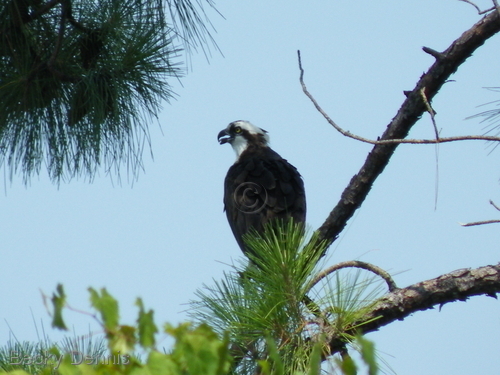 My husband captured this image of a powerful osprey sitting in a tree and also captured images of the nearby nest. 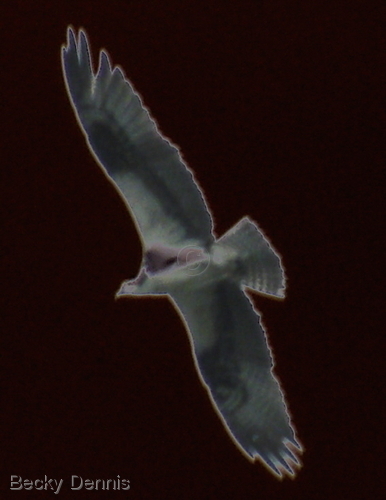 My husband captured this image of a powerful osprey soaring in the sky. It has been digitally altered for effect. One night when Chris and I came home a bit late, I spotted this beautiful praying mantis on the moonflower with the moon in the background. I mentioned to Chris that the only way the picture could be more "perfect" was if a night moth flew by when I took the picture. He laughed at me and said: "Yeah, right." So, inside I went to grab my camera and when I went back outside to capture some images, I was blown away and delighted to see perfection! Somehow that moth did show up and fortunately he did not become a snack for the mantis that night! This piece came forth easily today as I moved into the Feeling of a recent dream. 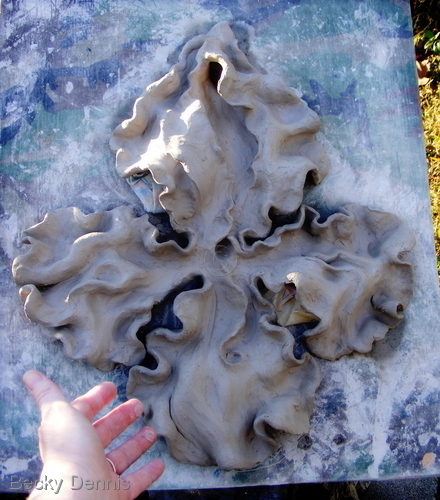 In it I could SEE these large clay Iris sculptures. After working thru a block, I was able to step out of the way and allow this piece to literally come forth from a Dream. Many thanks to Lana Chu for her inspiration in helping me re-member. Her work may be seen at artspan as well. See links section of my site. This piece will have melted Glass in certain areas IF it makes it to that point. Clay teaches me to enJOY the process and not be terribly attached to outcome. I did LOVE the process. 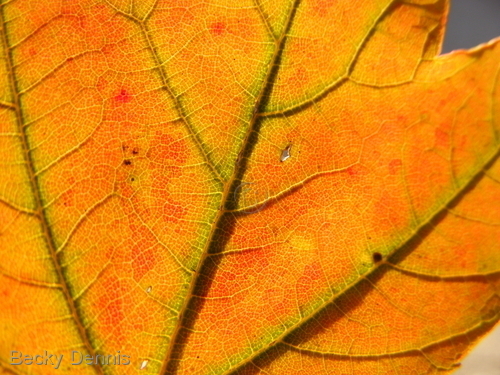 This simple image was captured one day in the fall. It is available to purchase in many sizes including greeting cards. 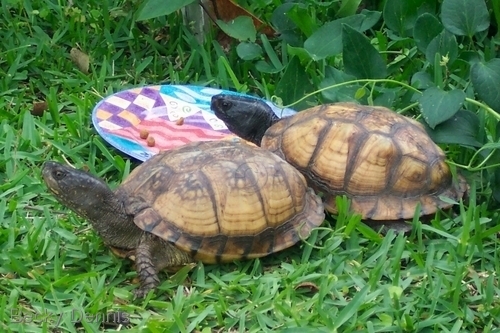 4 turtles in my yard! 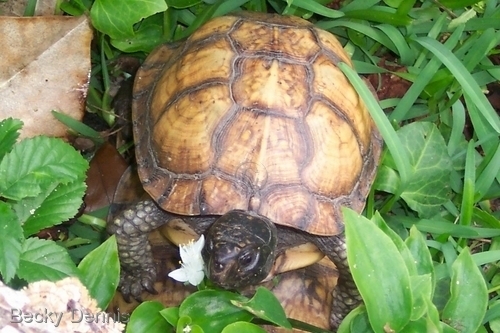 Turtle first appeared in our yard on my birthday, May 9th, back in 1998 after my Grandmother had died. They live and breed freely there even though we actually live in the city. These are sold, but I am creating more. Some are actually rattles with small pieces of clay within them. 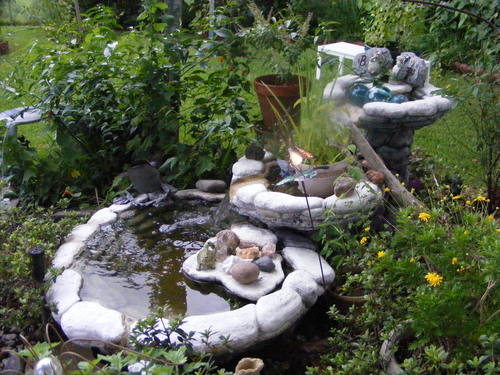 This is an area in our peaceful garden that features a waterfall with flowers growing in abundance all around. California Poppy poppin in the spring. 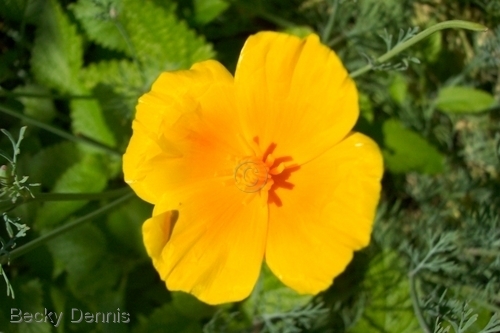 This patch of California Poppy are so sweet and make an excellent addition to a nice nervine tincture. 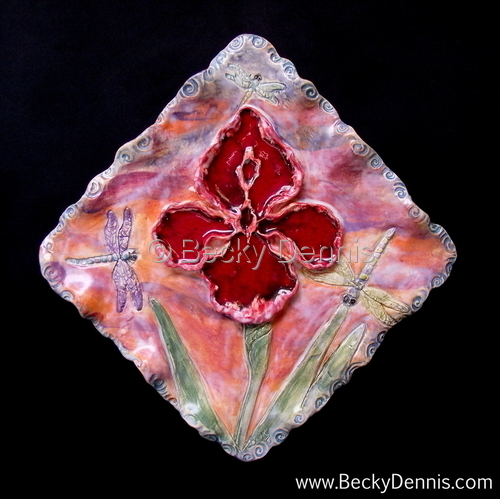 The canvas is CLAY and the iris is multi-fired with stained Glass inserts. 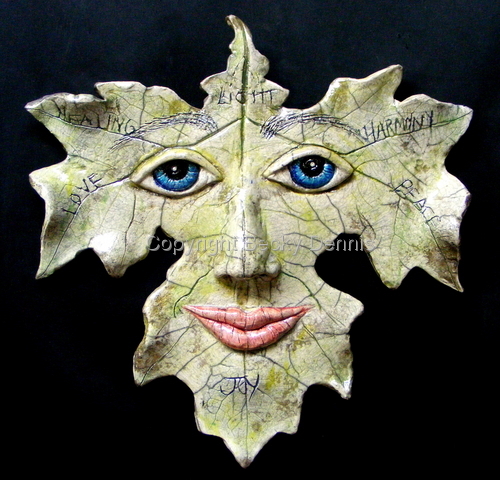 This wallhanging sold, however, I am creating new pieces and designs that capture my current interest and Feelings. 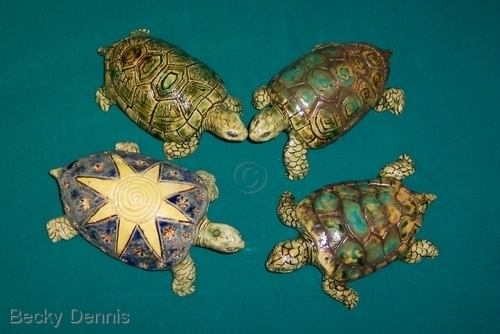 I can do some custom clay creations as well with specific colors of glaze and glass. Please feel FREE to contact me if interested. 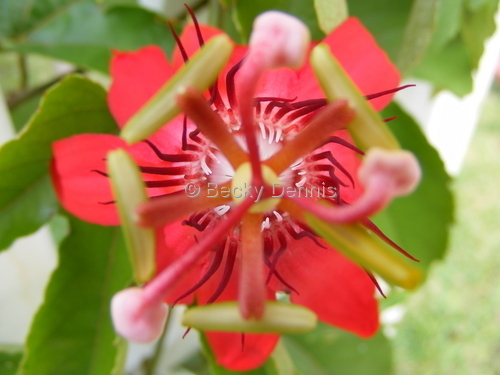 This is a red passion flower vine that is growing in my garden. This is also used in tea and tincture to calm and support the nervous system. 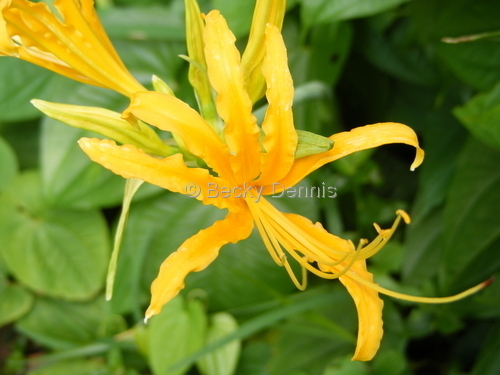 Recently, this hidden yellow Lily magically popped up in the garden. 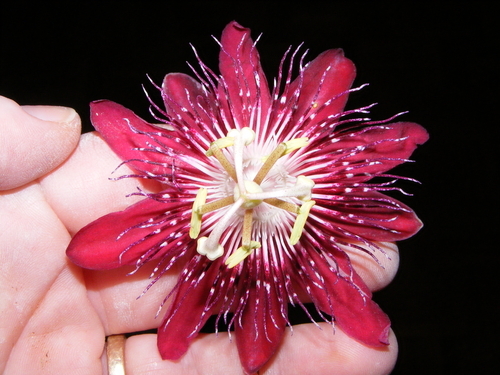 During the summer, I was able to find two varieties of red passion flowers for my Garden. 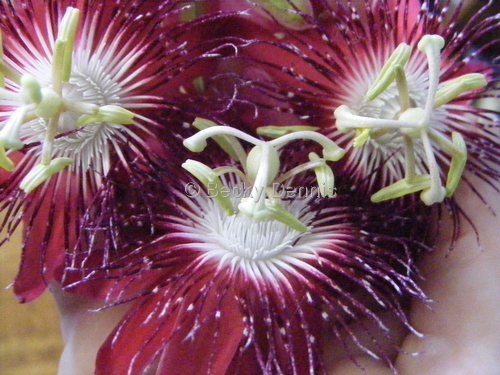 We also use these in a nervine (nerve)herbal formula. Fragrant Jasmine in full bloom. 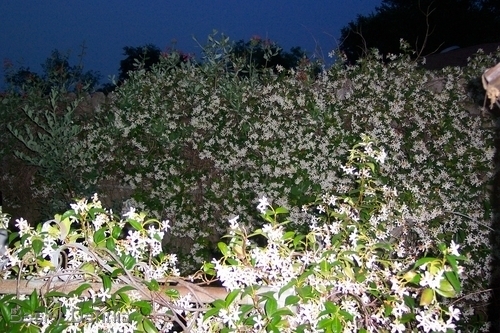 Along our fence area is a huge patch of fragrant jasmine that grows sweeter as the days grow hotter. 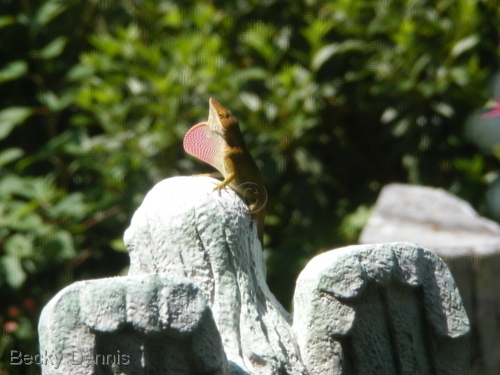 This image was captured one day as I was looking out the window and spotted the lizard surveying his garden from atop an Angel sculpture. 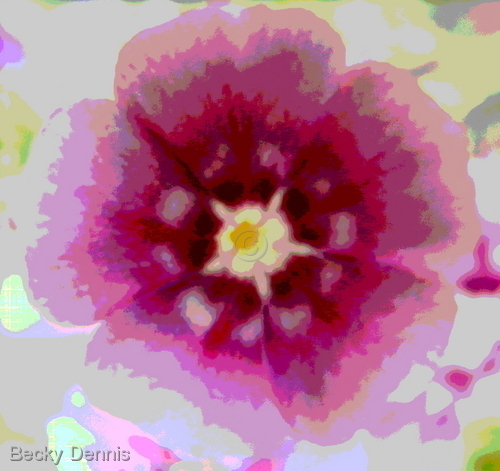 It is available to purchase in many sizes including greeting cards. 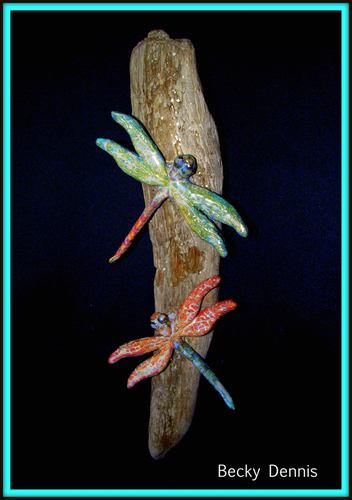 These dragonflies were created out of clay and then attached to a beautiful piece of driftwood. This is a wallhanging with copper wire and bead accents. Sold, but more on the way. 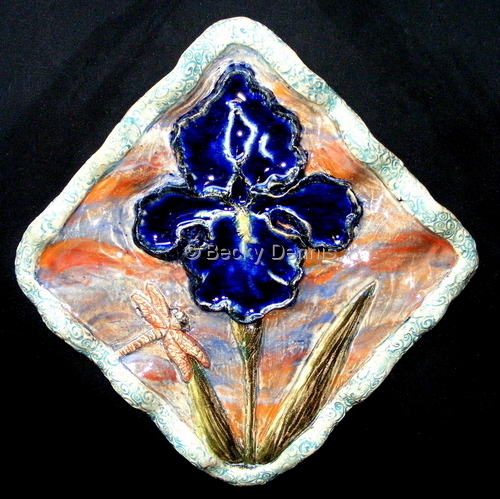 This handsculpted Iris wall decoration is mixed media with stained glass melted in the Iris. It is brightly colored, even though it is fired up to 2200 degrees. Purchased by Dr. Shutterworth and hanging in his office over the door. 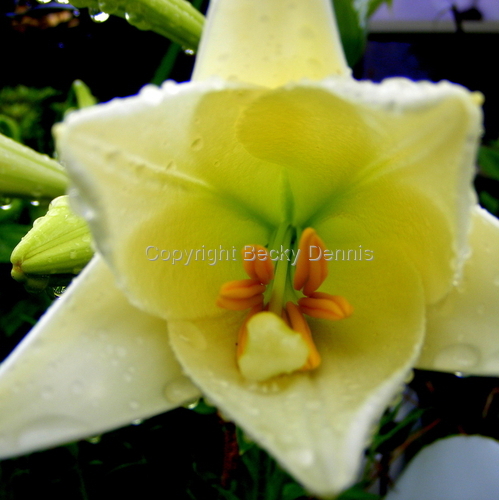 An Image of a soft and delicately fragrant Lily from our amazing Garden. It had just rained and the flower seemed to be bathed in the magic of the moment. 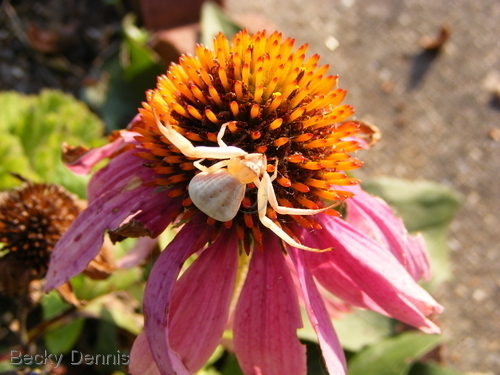 This image was captured in the garden one day as I walked about to gather medicinal plants and spotted the spider. I asked if I could take a picture to share with you and she said: "Of course you may, Keeper of my Home." 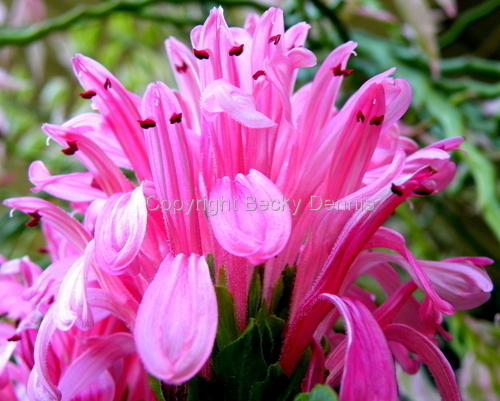 It is available to purchase in many sizes including greeting cards. This sweet, delicate Rose had such a beautiful spiral quality to it and a very sweet fragrance. It elevated my heart and mind to new levels of consciousness with it's generous Beauty. Love grows in my garden. Come and visit us. 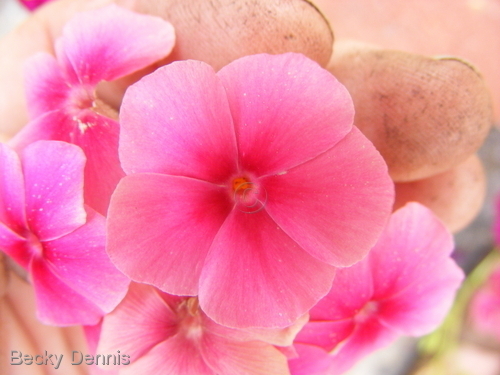 Pink Phlox Flowers with Joyful fingers. 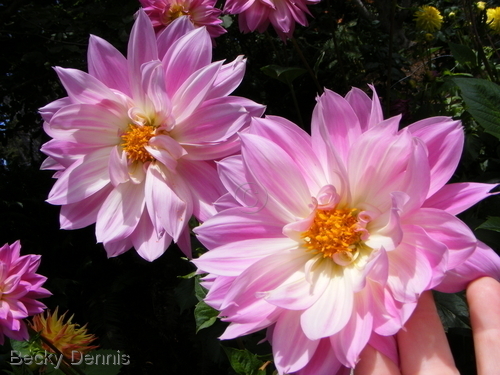 This image seems to Radiate and Glow with Life Energy.Notice my dirty fingers in the background? 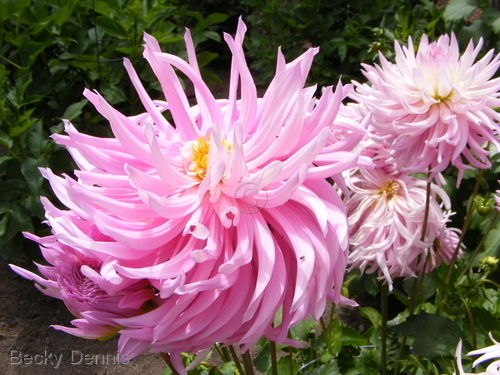 All photos are available to purchase, including in greeting card size. 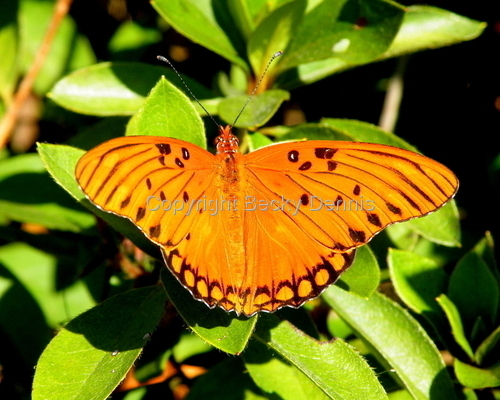 As an avid Gardener, we have so many wonderful Insects and butterflies in our Garden. We do not use any poisons or chemicals because we believe that ALL Life is interconnected. This butterfly lays it's eggs on the passionflower plant and the caterpillars eat them. Since this plant is used as medicine to calm the nervous system, that may explain why this Beauty flies so wobbley and funny! This patch of California Poppy are so sweet and make an excellent addition to a nice nervine tincture to create calm within. SOLD. 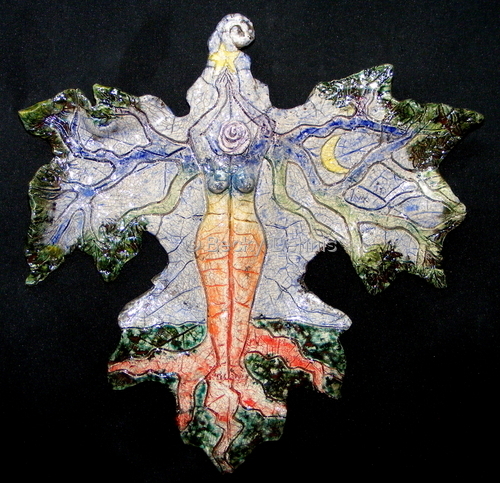 This is another creative Raku Tree Woman wallhanging with the message on the back that says: "May you Feel connected to love and beauty." These are created with a love and appreciation of the many Gifts offered to us when we reach UP. 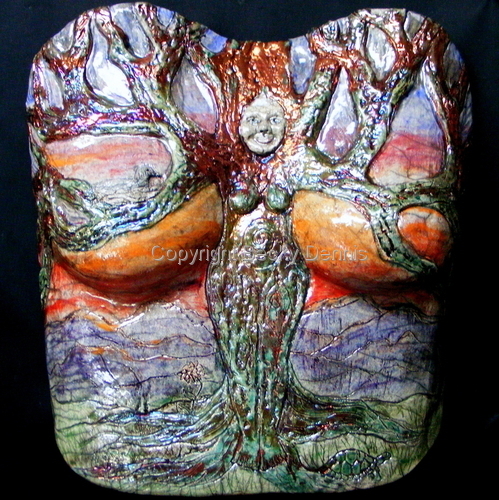 My absolute Love and Appreciation of Mother Earth resonates in this Raku Clay Sculpture. It sold in Lafayette, Louisiana at Festival International to an Art Patron and collector. 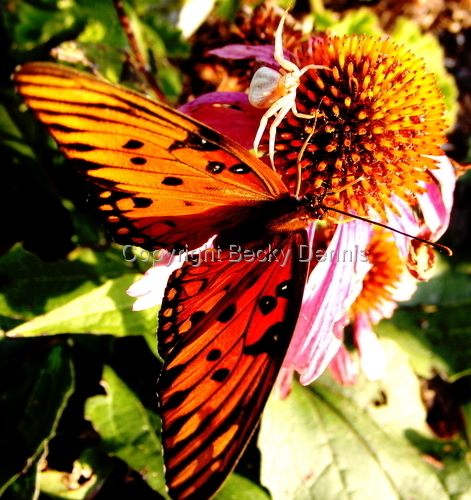 This image of a spider and a butterfly on a purple coneflower is so sweet. How is it that they can be in the same space Peacefully, yet we as humans are so challenged by that? Hummmm. Makes ya think we could learn something from the simplicity of that. 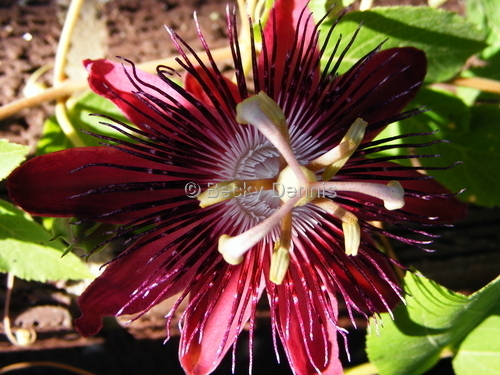 Photo available in all sizes including greeting cards.